The Oxford Critical and Cultural History of Modernist Magazines, Volume One: Britain and Ireland 1880-1955, edited by Peter Brooker and Andrew Thacker, Oxford University Press, 2013. £35. The process of studying modernist magazines – or ‘little magazines’ as they are sometimes known – has changed significantly over the past ten or fifteen years. One no longer has to track such publications down in the dusty vaults of university libraries or public archives, or purchase expensive facsimiles. 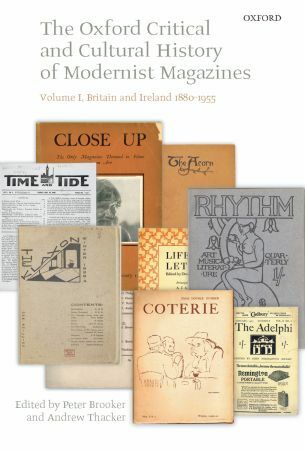 Most modernist magazines are now freely available online, either at the Modernist Journals Project, a co-venture between Brown University and the University of Tulsa, or at the more recent (and similarly titled) Modernist Magazines Project, based at the Universities of Sussex and De Montfort, and funded by the AHRC. Such online resources are clearly invaluable, ensuring the future of exciting research in this field. Indeed, both of these websites continue to expand at a rapid pace, with new magazines, essays and interactive timelines and, most intriguingly, digital visualizations appearing every month or so. Despite this wealth of online activity, important book-length studies continue to appear, the most recent of which is the paperback edition of the first volume of The Oxford Critical History of Modernist Magazines, first published in 2009, and edited by Peter Brooker and Andrew Thacker, co-founders of the Modernist Magazines Project. The Oxford Critical History of Modernist Magazines, Volume I seeks to chart the history of more than eighty ‘little magazines’ published in Britain and Ireland from 1880 to 1955 (although an essay on The Germ points to earlier precedents), and to assess their contribution to literary and (to a lesser extent) artistic modernism. It is a thick volume, spanning over nine hundred pages, and enlisting the help of almost forty contributors from universities worldwide. The range of journals discussed is impressively wide, from the very well-known (BLAST and The New Age) to the rather less renowned (The Acorn, The Mask and The Tramp). More than a twenty Edwardian journals are discussed at length within important critical essays by commentators such as David Peters Corbett, Ann Ardis and Jean-Michel Rabaté. The publications examined differ wildly in terms of size, paper-type, font-style, contributors and prospective readers, but were united by common struggles, from printing costs and flaky patrons to argumentative editors, messy manifestos and apathetic audiences. Though some of them sought to be more popular than others (unravelling each editor’s attitudes to commercialism proves a tricky procedure in many cases) few of them sought, or ever achieved, any substantial success. Indeed, the vast majority of them lasted no more than a few years. And yet they hold us still. Barely a page of BLAST has avoided close critical scrutiny; a situation which seems just as likely to intensify as to diminish. Little magazines are now a very big subject. It is, I think, the attention given to this so-called ‘mixed company’ which yields the most interesting results, bridging the boundaries between modernist historiography and the uneasy realm of the ‘not modern’, ‘proto-modern’ or ‘merely mildly modern’ (terms invented, I should add, for the purpose of this review).The extent to which such boundaries can be adequately bridged in a book dedicated to modernist magazines remains questionable. It comes as some relief, nonetheless, to see that this volume is at least willing to take this issue on. Ultimately, this serves as a fine introduction to an ever-growing field. Considering the subject – which has spawned many a knotty article in its time – the essays are all remarkably readable; well within the range of undergraduates, or those with no prior knowledge of little magazines. The volume is clearly set out, and skilfully edited. Attention is paid throughout to the material makeup of each magazine, with small black-and-white illustrations of the all-important covers and selected inner pages. Though this is no substitute for handling the real things – and it is to be hoped that the wealth of internet resources does not lead researchers to eschew these objects entirely – it reminds the reader that there was more to these magazines than just words. One wonders, in light of this, whether the volume might have benefited from essays dealing exclusively with the material or practical aspects of magazine publication? Though the introduction supplies an interesting chart noting the respective prices of selected magazines, it would be nice to see more on advertising, different printing techniques (especially in relation to the reproduction of images), concerns surrounding copyright, and the payment of contributors. This is the obvious risk of inviting essays on particular collections of journals: sometimes wider issues are overlooked, or inadequately traced across period boundaries. These, however, are minor complaints. The truth is that anyone studying this field is spoilt for choice at present. If this volume doesn’t cover everything (in such a wide topic, there are bound to be omissions) it seems highly likely that the answers may be readily found elsewhere; either online, or in other publications (Modernism in the Magazines : An Introduction, Yale 2010, to state another example). Otherwise, this is a very well-organised, consistently engaging and suitably comprehensive introduction to a deeply fascinating topic. This entry was posted in Resources, Reviews and tagged modernist journals, modernist magazines. Bookmark the permalink.